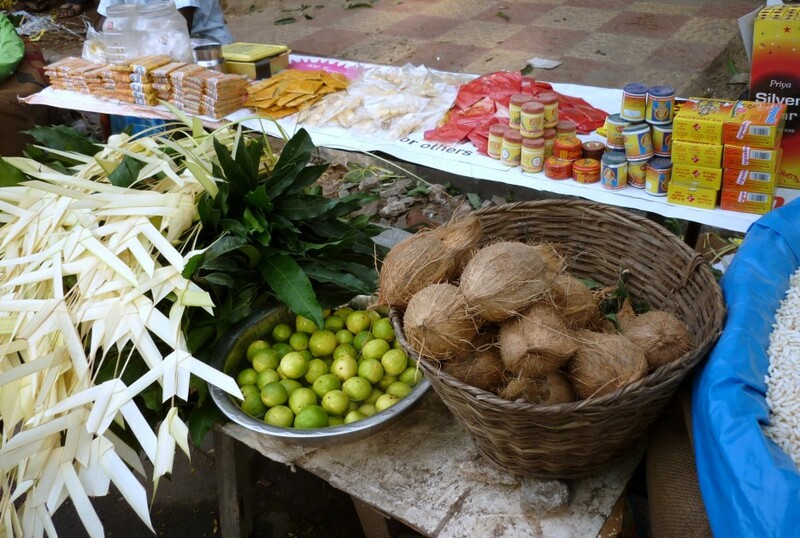 Today was Ayudha Pooja and we went to the market place only this morning to get all the things needed for the Pooja. 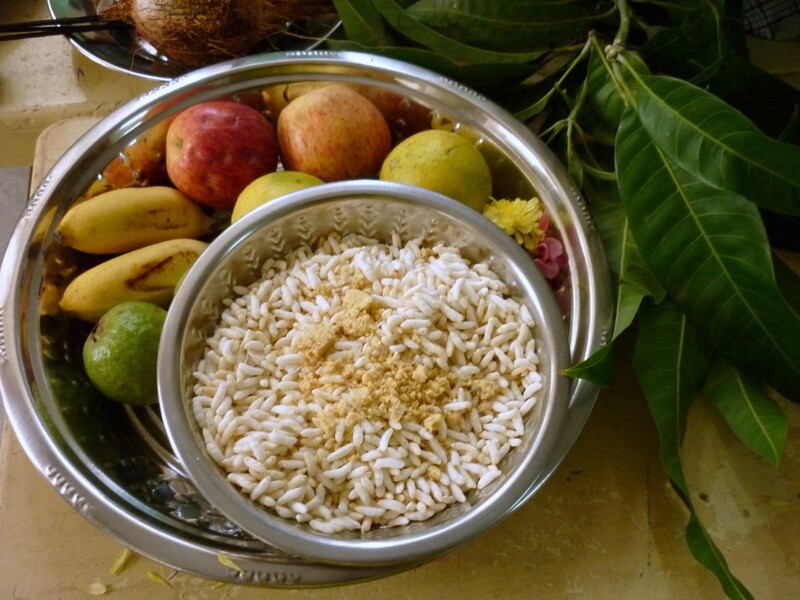 The vehicles were washed and decked up with flowers, and the fruits, puffed rice were offered as part of the pooja. Mostly importantly, the boys were told that today was the day the lemons were kept under car tires and ran over. Both of them woke up very early and as if they discussed together without me knowing, they were all smiles and asked if even more getting up from bed, if we were going to put the lemons under the tyres. We managed to go to the Market without them, even though they were crying. Obviously couldn’t take them along. Once back, they were settled down and were calm. 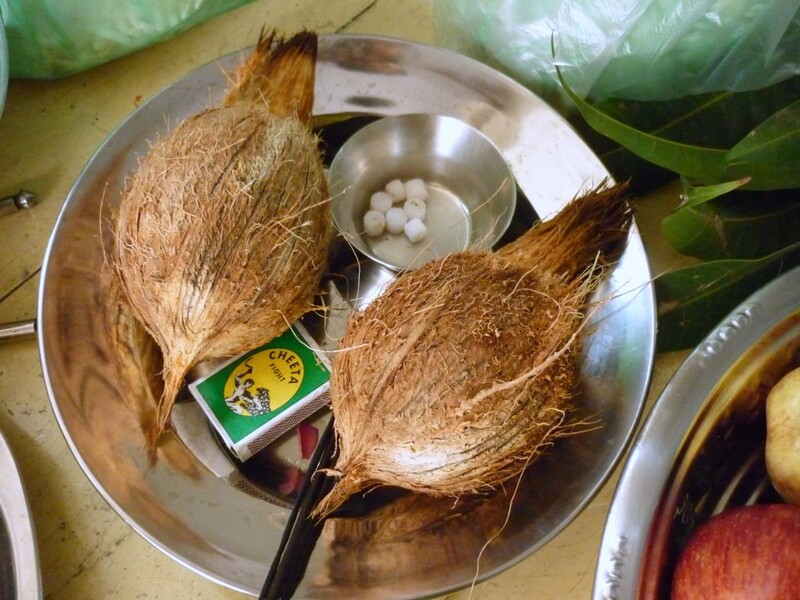 Even until this morning I was very confused as to what should be offered for neivedyam. 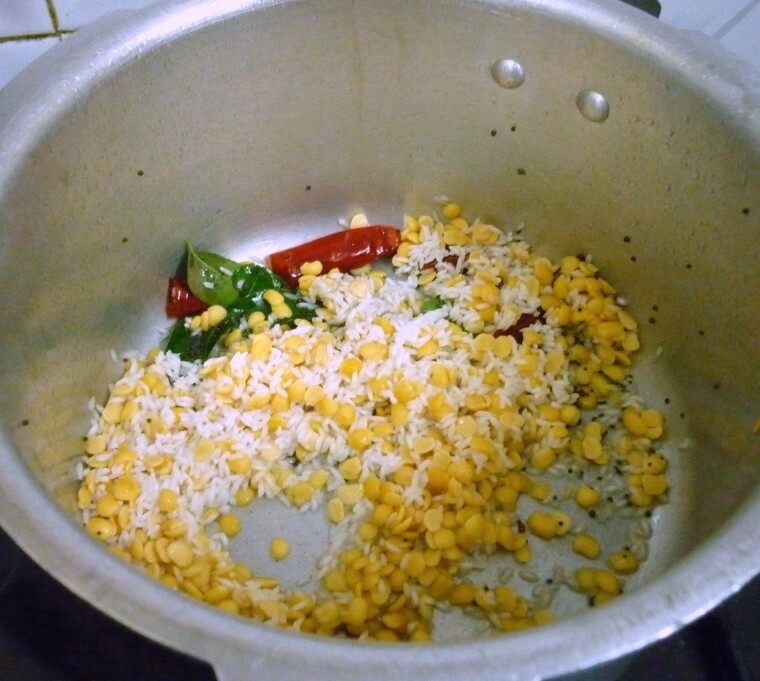 Chickpea Sundal or Konda Kadali Sundal is a must for today. So that was made, then Amma suggested I make Kesari bath and maybe lemon rice. I started preparing the neivedyams and half way through realized that time was not enough and postponed the lemon rice for tomorrow. I wanted to make Beetroot Masala vada, thinking I have beets with me, I was disappointed that it wasn’t there. Then I thought I must make Carrot Masala Vada, finally I settled with just the regular Masala Vada. I guess it was too much of a confusion, though I am happy I ended up making something new. Arisi Paruppu Sadam was something I always wanted to make. My colleague had got it yesterday and I was thinking I must make it soon though I never realized I would make it this soon. It is such a simple, yet delicious combination of flovours. You would be deceived to think that this might be the regular Sambar Sadam or Bisi Bela Bath. It’s neither, yet so much same in the ingredients you have to use. Arisi Paruppu Sadam is the simplest you can get to make. One can add Onions, Tomatoes and whole lot of vegetables if you want. But it is mostly made when one is short of vegetables or when in want of comfort food in the quickest time possible. Even without any of these other ingredients, the simple Tadka / Salichal / Tamilpu / Popu made all the difference. The Arisi Paruppu that my colleague had got, I was able to find the rice as grains very distinctly, while mine was little over cooked. Maybe because I ended up adding more water than the usual. 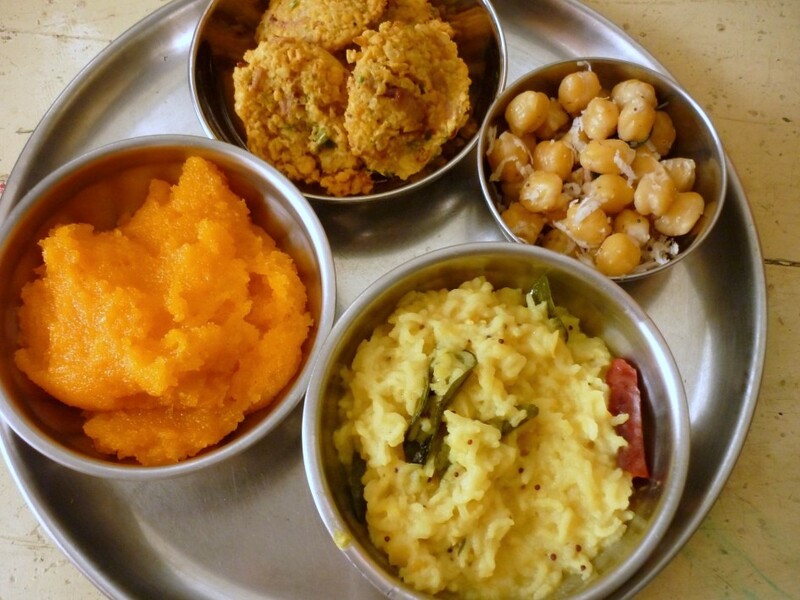 For the Navaratri Pooja Day 8, the neivedyam were Kesari Bath, Masala Vada, Chickpea Sundal. When we went shopping this morning, I managed to click some pictures of the things sold specially for today. Once the pooja at home was over, we did the Ayudha pooja. Boys were so excited to do their share of work in placing a lime under each tyre. Then they eagerly waited for us to run over it once the pooja was over. 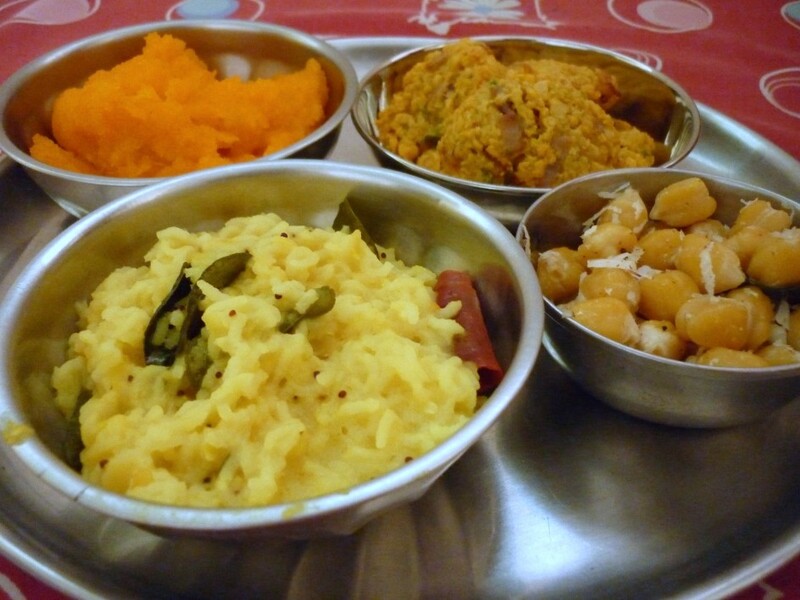 The ratio of dal with rice can be varying. You can add 1: 1/2 or 1/2 : 1/2. either ways it turns out great. 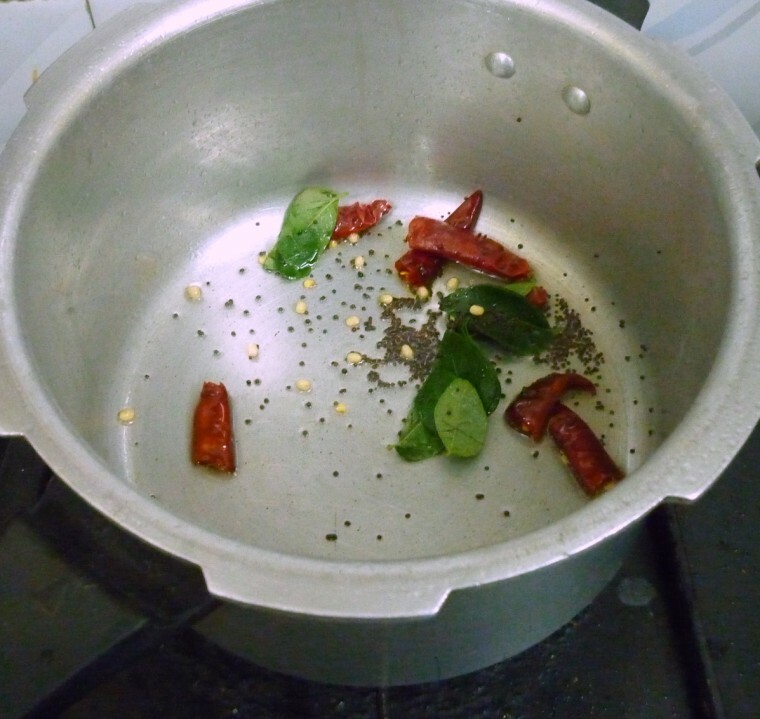 Dried Red Chilies – 3 -4 , broken into half. 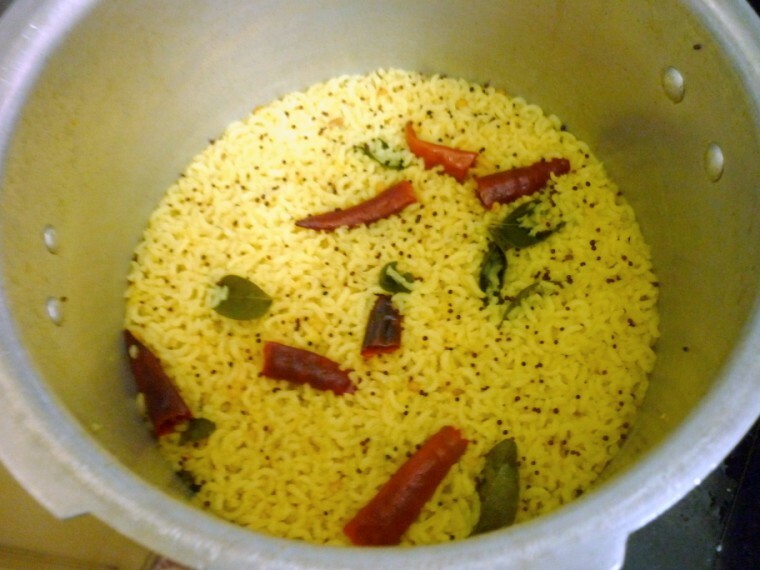 Was and soak the rice and dal together for 15 – 20 mins. 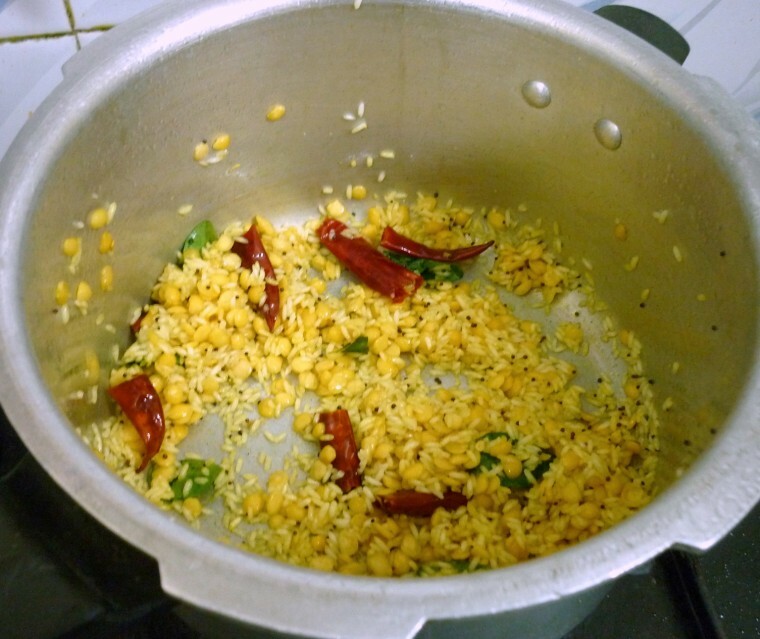 In a pressure cooker, heat oil, add the mustard, urad dal, curry leaves and dry red chilies. Saute well. When the mustard pops, add the drain rice, dal mix and saute in oil for couple of minutes. Then measure 2 cups of water and add to the pan along with turmeric powder and salt. Mix everything well and cover with lid. Pressure cook for 3 whistles and allow the pressure to fall down. Serve with appalam and pickle. You can add ghee if you prefer after it is cooked while it is still hot. Can add onions, tomatoes and other vegetables that are normally added in Sambars. Though I must say this simple mix of dal and rice was heavenly by itself. 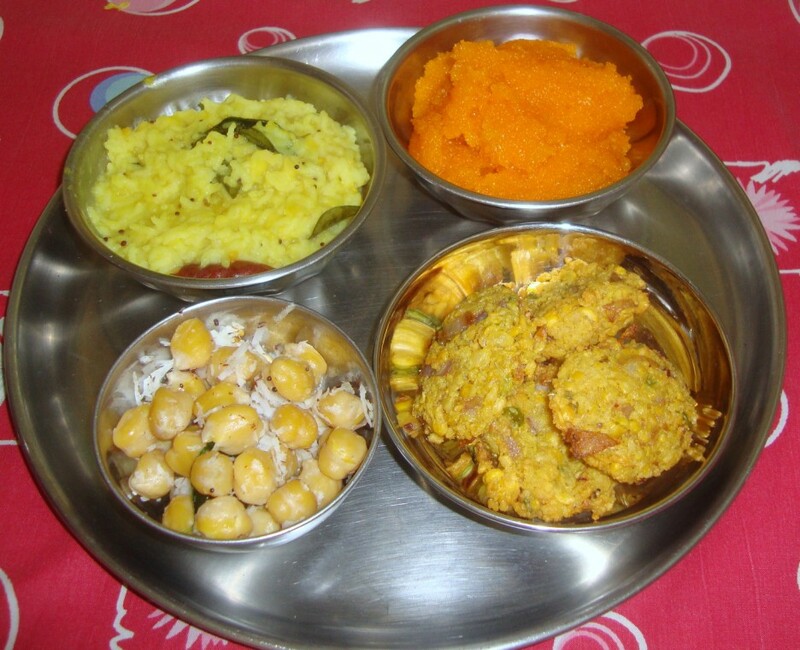 Some add sambar powder or other spice powders, but then the basic taste might change very much on this. looks like Dasera is going well for you with all the yummilicious dishes and naivedyams! :)very colorful and delicious platter!. Happy Dasera to u and ur family! 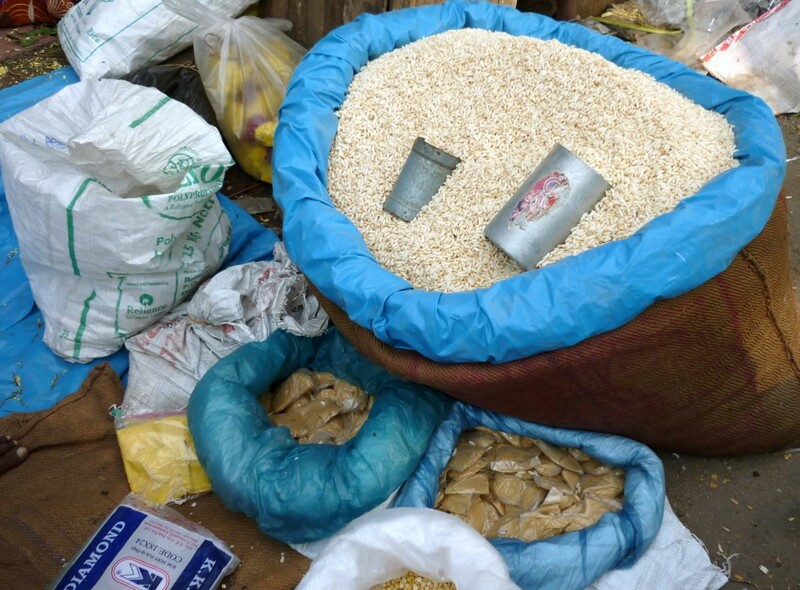 Sounds like plain old what we call khichidi only its made of moong dal. Sounds fas but will try as you say simple comfort food. Thanks for sharing all the pics too. That should be a real comfort meal.. 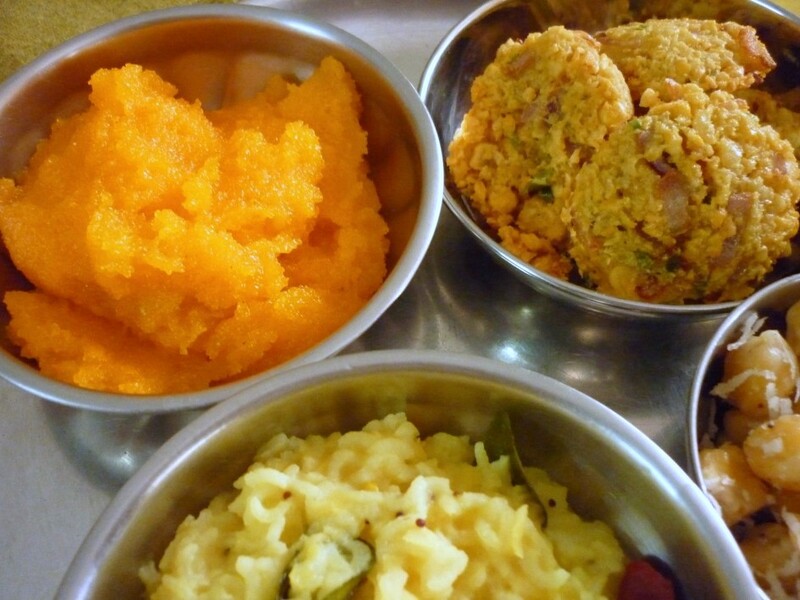 Wonderful spread, cant take my eyes from the arisi paruppu sadam and kesari baath,makes me hungry.. Such a beautiful platter……..love it. i can believe the excitment with the 2 boys. Love the whole plate Valli.